Over two nights (one longer than the other) the Town Council brought to a close the FY 2019 budget cycle. They voted to approve the proposed budget and voted to use approx. $1.5M from the budget stabilization fund to balance the budget. The budget cycle started in Nov/Dec 2017 when each department in the Town reviewed their operational and capital budget requirements with Town Administrator Jeff Nutting, et al. The capital budget was reviewed in part by the Finance Committee in January approving the utilization of some of the free cash for the capital requirements. The balance of free cash was reserved to cover any overage of the snow/ice budget. The decision on the remainder of the free cash amount will be made in June before the fiscal year closes. The operations budget was reviewed in the Council Budget subcommittee and a joint budget subcommittee meeting (including Town Council, Finance Committee and School Committee) before beginning the formal budget hearings by the Finance Committee in April. After the 3rd hearing, the Finance Committee voted unanimously to recommend the budget as proposed by the Town Administrator to the Town Council. The Town Council held their first budget hearing on Wednesday. Like recent years, the budget line items were formally read and if a Councilor had a question on the line item, it was placed "on hold". After all the holds were placed in the reading of the budget, each question was answered and some cases additional discussion ensued on the item before moving to the next budget line item. Although this allows questions to be raised and answered in this format, the entire budget is not really presented to the Town Council. If you want that kind of presentation and open discussion you need to participate in the Finance Committee budget hearings. At the end of the 'long' evening Wednesday (almost 2 hours), it was determined that the department managers and representatives were not going to be required for the Thursday meeting. There were not planned to be any more serious questions raised that the departments would need to answer. The Thursday session opened and was completed within 25 minutes. Three separate votes. One to approve the bulk of the operational budget excluding the Tri-County portion. One to appoint a clerk pro temp to replace Councilor Jones who needed to recuse himself from the Tri-County budget vote. He teaches at Tri-County and to participate would be a potential conflict of interest. The third and final vote was for the approval of the now full budget including the approval of the approx $1.5M transfer from the budget stabilization account to provide a balanced budget. The first vote for the operational budget passed 8-1 (Earls voted 'no'). The vote for the full budget passed 8-0-1 (Jones recused). The budget stabilization funds carefully set aside in 2013 has now bought some time for the Town (and yes that means you too!) to have some serious discussion on what to do next year. The budget for FY 2020 is already approx. $1.5M short (due to the use of the one time funds this year). The School Committee had acknowledged using multiple millions from their revolving funds each of the last three budgets some of which were 'one time', i.e. not replaceable. The needs of the Town to maintain current service levels continues to increase. Police and Fire are seriously understaffed in comparison to other similar sized communities. The 3rd ambulance that is needed for the Town to provide sufficient life saving response times would itself call for an additional $1.5M. The School Dept requirements that were unmet by this year's budget are long. The DPW is strapped to maintain over 200 miles over roads with 'nickels and dimes' funding and a very efficient process. 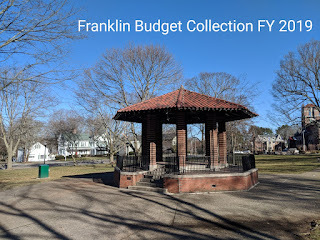 What would Franklin like to do for the FY 2020 budget? There is not likely any miracle funds available. The 2.5% cap is not sufficient to meet our needs. Fortunately, the Town Administration has stated that the discussion will start early in the FY 2020 cycle. I, for one, will be watching and reporting to ensure that the discussion does happen.